When I was in college I had a professor who knew just about everything. He could intelligently articulate some knowledge on nearly any subject. It was soon after entering his Urban Studies class that I discovered how this was so. His office consisted of three very large rooms filled to the brim with books. And I don’t mean books stacked neatly on shelves like you might find at your local Border’s Books. I mean, no-room-to-walk, filled with books. I’m sure he had upwards of 10,000 books, magazines and newspapers crammed in those three rooms. 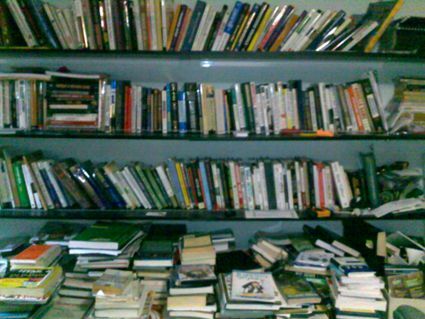 The first time I visited his office, I asked had he read all those books. Without hesitation he said, “Yes.” I don’t know why but it struck me as one of the best things I’d ever heard. The pursuit of knowledge in and of itself just appealed to me. I thought to myself, “I want to know all there is to know about a bunch of stuff. I’m going to have a library like this too.” Over the next twenty years (sigh! ), I’ve accumulated a hodgepodge collection of books, newspapers and magazines. And yes, I’ve read most of these items in whole and all at least in part. As was my goal, over the years I’ve accumulated a lot of knowledge over a modest array of topics. However, as I’ve gotten older and perhaps a natural byproduct of doing so, I’ve become less interested in learning about a wide range of topics. I haven’t thought about that change too deeply, but every now and again the thought pops in my head as to why this might be so. I’ve brushed it off as simply being in a reading slump or being occupied with other things. But I’m also filled with the thought it’s more to it. As the movie progresses Charles, Robert and Robert’s aide (played by Harold Perrineau of Lost and Oz fame) are put in a situation where Charles’ theoretical knowledge is put to the test. Without giving the movie away (it has several other sub-plots and is definitely worth a Netflix), Charles experiences some success in converting the theoretical to the practical. When it’s all said and done, it’s only after he’s put to these tests that he feels any sense of real accomplishment. Books is for reading, life is for doin’. As I approach a milestone age for me and with the next decade on the horizon, my life will become a grand lab experiment. I have the knowledge, I know what to do, now it’s time, it’s past time, to do it. Well said dear Ben. I believe that in order for us to reach that discovery, we must go thru some trials and tribulations. I had a similar experience while studying at B.U. that feels like million years ago. I could not get enough of learning. I always felt the need to prove to myself that I was smart. Please don’t interpret this as me needing to be “smarter” than anyone else. On the contrary, my conflict was between me, myself and I. In fact, after I graduated I worked full-time for the university just so I can take classes for free. So I started studying, again- full-time. This time around, it was learning languages. French, Spanish, and couple of history classes for added seasoning. I took that education to the next level, I lived abroad for a while. That’s when my self-discovery began. One of many to come… It was to learn by doing- taking action, One that I call my“ BE , DO, HAVE” attitude. Eventually, the languages began to flow naturally, the knowledge became fluid. The need to be “smart” was not important to me anymore, but the experience was far more important. Sounds cliché’ but so true, “it’s not the destination, but the journey”. That attitude has been the impetus to propel me to move forward toward my dreams. Now I’m in culinary school studying to be a chef. Boy, let me tell you, a lot of the “being smart” issues have come up for me. It’s no longer about being book smart either. It’s competitive, it’s overwhelming, and each moment the need to be the best always always always comes up. Smarter, creative, faster, etc…. However, now, all of my life’s work of education, and life experience, at the ripe old age of 42 has carried me through. For that I am truly grateful and humbled, that “Be Do Have” attitude has become my mantra. We shall see what’s in store. But no amount of books (that I cherish) will prepare me for the next step forward. @Sonia: thanks for sharing so much. I’m trying to wrap my mind around my own “Be, Do, Have”.